In the weeks leading up to the 2015 centenary of the Gallipoli landing, the rampant commercialisation of the word ‘Anzac’ brought a little-known law to the forefront of a debate about commemoration and commerce. Before this time, few Australian traders or consumers knew that the use of the word ‘Anzac’ in public life was restricted. Few historians had studied the law in any depth. In fact, regulations prohibiting the use of the word ‘Anzac’ in any trade, business, calling or profession had been enacted almost 100 years earlier under the War Precautions Act. Shortly afterwards, these regulations were (somewhat inexplicably) extended to prohibit Australians from naming houses, boats and vehicles ‘Anzac’. After the war ended, federal authorities acted to safeguard the word in perpetuity through the Protection of the Word “Anzac” Regulations 1921. 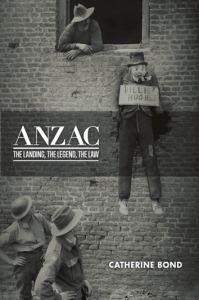 In her first book, Anzac: The Landing, The Legend, The Law, legal scholar Dr Catherine Bond argues that the regulations are far from a legal oddity. Using an interdisciplinary approach, synthesising legal and social history, she traces how the regulations have operated to shape Australian’s relationship with the national mythology over a century. Bond’s first four chapters largely focus on the wartime and interwar period. She traces the emergence of a growing mystique around the word ‘Anzac’ after the Gallipoli landing and how and why regulations were enacted to protect it. She pays particular attention to their chief architect, Sir Robert Garran. She then outlines the impact of these regulations on Australian veterans and families, how the regulations were enshrined into law after the war ended, and how Australian authorities sought international protection of the word, outlining different approaches taken by New Zealand, Britain and the United States. The final two chapters explore the ways in which the law has been enforced from World War II until the Anzac centenary, probe the law’s constitutionality, and offer suggestions for legal reform. Bond stakes out three main arguments. First, that the introduction of regulations had an enormous impact upon the ways in which Australians related to the emerging mythology. It wasn’t just politicians or generals who described the word ‘Anzac’ as ‘sacred’; pressure to protect it came from Australian communities. Bond notes, however, that the law came to limit the ability of returned soldiers to distinguish themselves, and of bereaved families to commemorate the war dead, resulting in significant emotional and financial hardship. Secondly, Bond scrutinises the claim made by historians, including Graham Seal and myself, that the Anzac regulations were politically motivated. She argues that ‘there is no evidence to suggest that the law was conceived or for the most part used for … political purposes or directed towards the creation of the “Anzac Legend”’ (p. 12). If the Anzac regulations were not politically motivated, it follows that they were not intended to directly serve the defence of the nation. On this basis, Bond argues that it is ‘unlikely that the legal control of “Anzac” during World War 1 was constitutional pursuant to the defence power of the War Precautions Act’ (p. 79). Bond is right to probe the politicisation of the word ‘Anzac’ during the Great War. Her analysis is interesting, insightful and she makes some salient points, which cannot be explored in detail within this book review. However, the deployment of the War Precautions Act to protect the word was quite deliberate. It constitutes evidence in itself that Hughes and Garran saw a clear link between the sanctity of the word and morale on the home front. The regulations were less about providing federal authorities free reign to politicise the word, than to ensure it was not profaned by opportunistic traders. In 1916, when Australians were confronted with the harsh reality of war, protecting the sanctity of the word ‘Anzac’ was equated with prohibition. Today, when a personal connection to the past no longer exists, memory must be manufactured. The sanctity of the word ‘Anzac’ is maintained through production. This distinction explains the divergent contemporary interpretation of the law. As Bond observes, ‘within the space of a century, the use of Anzac has gone from being denied to appear on commemorative pins and badges following the Gallipoli campaign to today being adopted on wristbands, mugs, t-shirts, candles and tea towels’ (p. 133). Anzac: The Landing, The Legend, The Law is a testament to the value of interdisciplinary historical enquiry and the extent to which legal scholarship can reveal insights into our relationship with traditions and symbols of the nation. As Bond states, ‘The type of research presented here matters’ (p.15). Bond’s first book is ambitious, exploring 100 years of legal and social history. It is well written and researched and offers brand new insights into the Anzac tradition. Bond has made a valuable contribution to the critical discourse probing our enduring national myth. Jo Hawkins (@History_Punk) completed her PhD thesis at the University of Western Australia in 2016 and is currently adapting it into a monograph: Brandzac: The Commodification of Australian Military History. Jo Hawkins, ‘Anzac for sale: consumer culture, regulation and the shaping of a legend 1915–21’, Australian Historical Studies, vol. 46, no. 1, 2015, pp. 7-26; Graham Seal, Inventing Anzac: The Digger and National Mythology, University of Queensland Press, St Lucia, 2004, pp. 136-37.